Manchester City moved to within one victory of an inevitable Premier League title triumph with this straightforward win at Goodison. 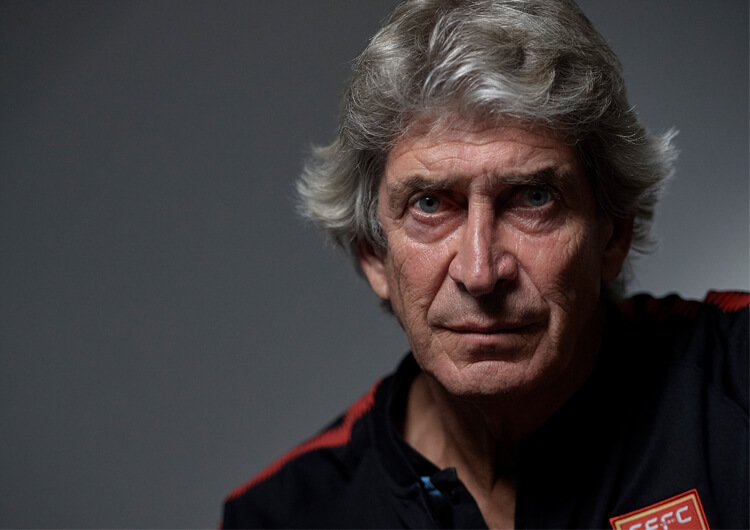 As poor as Everton were throughout – and they really were – Pep Guardiola’s men were at times breathtaking during a first half in which they fair blew the opposition away. Leroy Sane’s fourth-minute volley was probably the pick of City’s three goals, with Gabriel Jesus and Raheem Sterling also on the scoresheet, but David Silva continued in his rich vein of creative form and Kevin De Bruyne ran the game from a slightly deeper position than usual. Yannick Bolasie’s admittedly superb second-half strike was nothing more than consolation for the home side, who picked up only as the visitors took their foot off the gas in anticipation of Wednesday’s huge Champions League tie with Liverpool. Everton set up with a 4-2-3-1 formation when in possession. In the wide areas, Theo Walcott and Yannick Bolasie supported Dominic Calvert-Lewin, who started in the number 10 role behind lone striker Cenk Tosun. Wayne Rooney and Morgan Schneiderlin sat deep in midfield, acting as the defensive screen in front of the back line. Despite being the home side, it was always going to be a tall order for Everton to acquire meaningful spells of possession.  Therefore, they set up with a compact medium block, in a bid to limit both the time and space Man City’s midfielders had on the ball. They occasionally pressed higher up the pitch, but lacked both organisation and detail, particularly with regards to which direction to force the ball. They often ended up with individuals pressing, rather than a much stronger collective, and were consequently all too easy to play through. Their front four were thus taken out of the game, meaning the defensive structure relied on how their back line and deep-lying midfielders could protect and defend spaces in and around the penalty area. 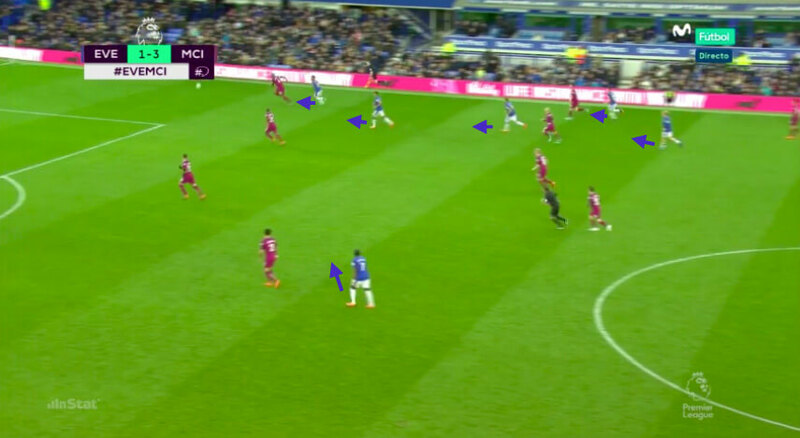 When Everton did regain the ball, they looked for longer balls from deep, targeting the Man City full-backs during the transition to a defensive back four. Despite Tosun and Calvert-Lewin consistently winning the first headers, however, the home side had limited success against a City back line that were extremely alert to the second balls. 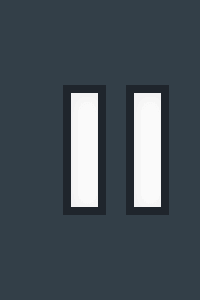 A similar pattern emerged for Everton in the second half. They continued to play longer, more direct passes towards the full-back areas with mixed success. 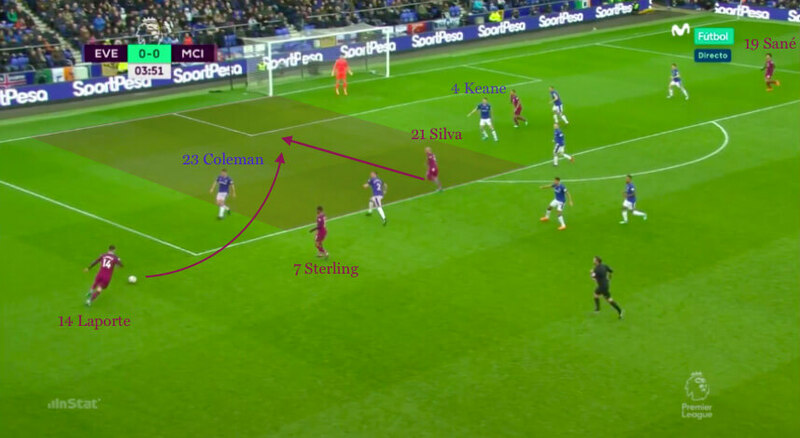 After a somewhat surprising yet superbly taken goal from Yannick Bolasie, however, they began to hunt and press the ball much more efficiently, forcing City out towards the touchline and often back towards their own corner flags. With the visitors still reluctant to clear the ball long, Everton found themselves regaining possession much higher up the pitch – while the introduction of Tom Davies for Wayne Rooney added much more energy to the pressing in midfield areas. 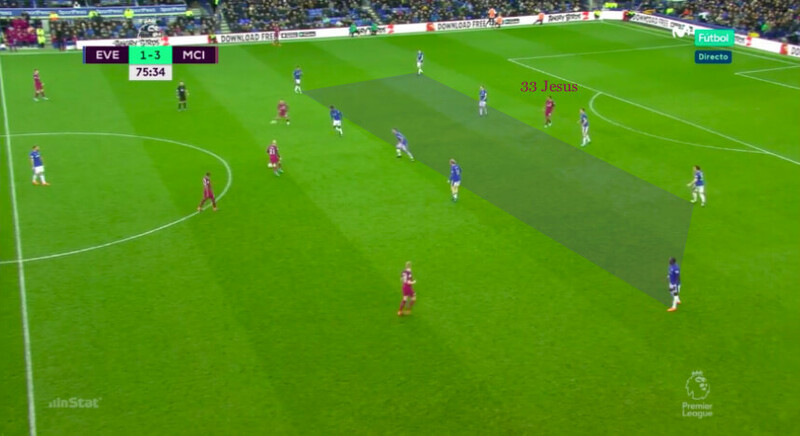 As Man City weathered this brief spell of insecurity and began to reassert their dominance, Everton reverted to a defensive 4-5-1 shape when out of possession, seemingly to see the game out without suffering any further damage. 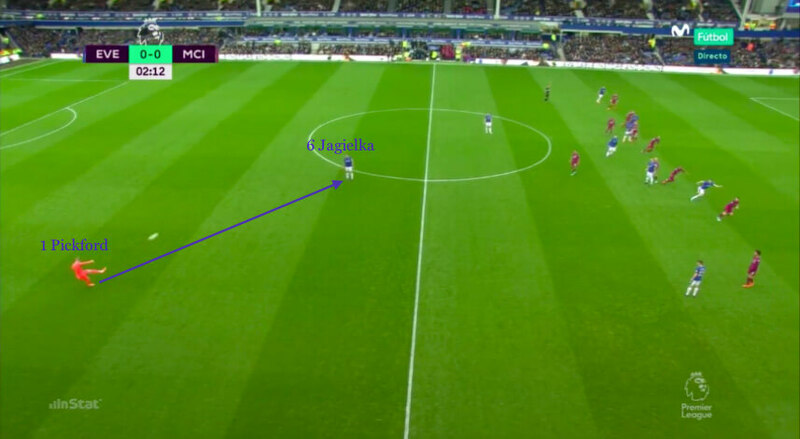 Manchester City played with a high line throughout the game, which Everton tried to exploit with long balls from deep, as shown here. Despite having a short option in Phil Jagielka, Jordan Pickford elects to play a longer pass, with forward runners looking to win the first or second balls against the City full-backs. Leroy Sane, Kyle Walker and occasionally Aymeric Laporte provided constant width for Man City, stretching Everton’s back line and creating gaps for Raheem Sterling and David Silva to exploit. Silva in particular made driving runs in between Seamus Coleman and Michael Keane, here crossing for Sane to volley home exquisitely. With City breaking Everton’s first lines of pressure with ease, the hosts were forced to revert into a deep and congested block. They alternated between a back four and, as here, a back five in order to track City’s dangerous wide runners in Sane and Walker. 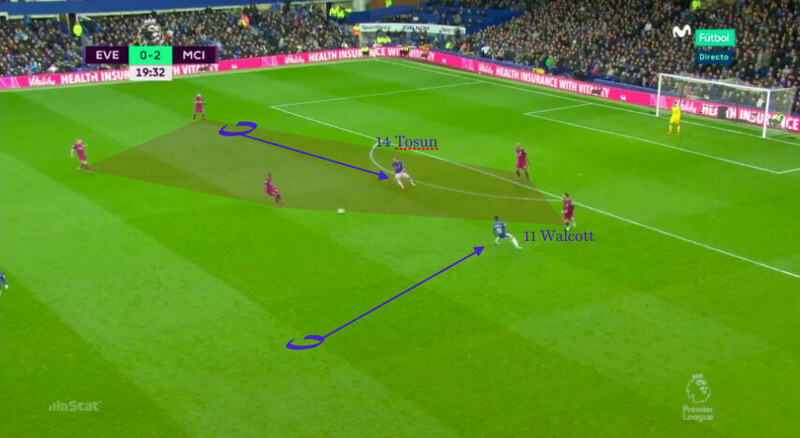 Man City looked to set up with a ‘W-M’ structure, especially when building from deep. Any time Everton committed an extra body forward to press, a Man City player dropped deeper to support, maintaining numerical advantage. Here, Wayne Rooney steps out of his defensive position to support the press, but David Silva drops deep to maintain the overload – in this case, six versus five. 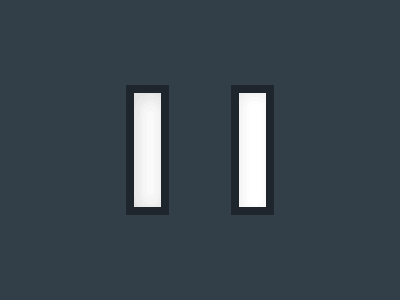 The second aspect to City’s ‘W-M’ structure. With Everton sitting in their compact block, City set up with Sterling and David Silva looking to combine with Sane and Walker out wide. Gabriel Jesus varied his movements, looking to drag defenders out of the compact Everton structure and create room for the wide runners to attack. Everton varied how they pressed Man City's deeper build-up. It was often poorly executed, with various different players pressing at different moments in the game. Here, both Theo Walcott and Cenk Tosun individually press their closest man, without any support from their midfield. With City’s quality on the ball, not to mention their significant numerical advantage, they were easily able to beat the first press. Everton attacked using longer, more direct passes throughout, often from the goalkeeper or defensive backline. 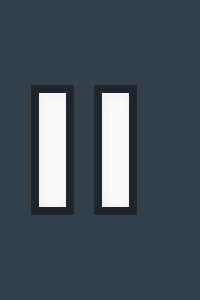 Even in situations such as this, where Jordan Pickford has two good short passing options against an isolated Gabriel Jesus, he decides to play longer. They targeted the Man City full-backs, looking for flick-ons in wide areas. Following Yannick Bolasie’s second-half consolation for Everton, the home side did become more aggressive in their pressing. Their defensive structure moved higher up the pitch and, pressing in larger numbers, they squeezed Man City back for a 10-minute period. The visitors regained control of the game thereafter. Once the visitors regained control of the game, they looked to intelligently kill the game off with sustained periods of non-threatening, lateral possession, committing only Jesus beyond the ball. Everton were happy to move back into a compact 4-5-1 block. As Man City didn’t commit many players forward for the closing parts of the game, David Silva struggled when making his previously penetrating runs in the inside left channel – particularly with Raheem Sterling, whose movement had created space for Silva to receive possession throughout, having been replaced by the less adventurous Bernardo Silva. Manchester City started with a 3-5-2 formation, with Vincent Kompany, Nicolas Otamendi and Aymeric Laporte making up the back three. Kyle Walker and Leroy Sane would provide the width, as Gabriel Jesus and Raheem Sterling looked to attack Everton’s central defenders. City dominated the ball throughout the first half, often building short from goalkeeper Ederson. 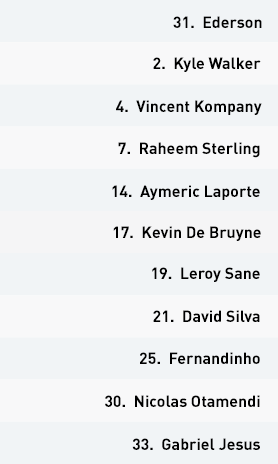 Kevin De Bruyne dropped deeper alongside Fernandinho in central areas, to support the build and help create a five-versus-four overload against Everton’s first lines of pressure. 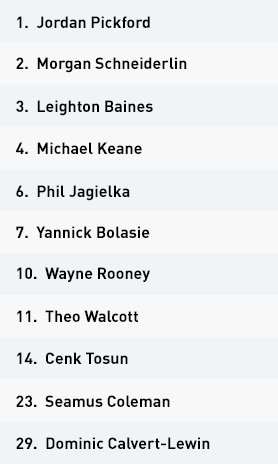 With the remaining City players maintaining much higher positions, this limited Everton’s ability to throw extra men at a potential high press. Coupled with Ederson’s ability to hit extremely accurate long passes, City had no issue bypassing Everton’s initial lines of pressure. In possession, the visitors also had maximum width provided by Sane and Walker. 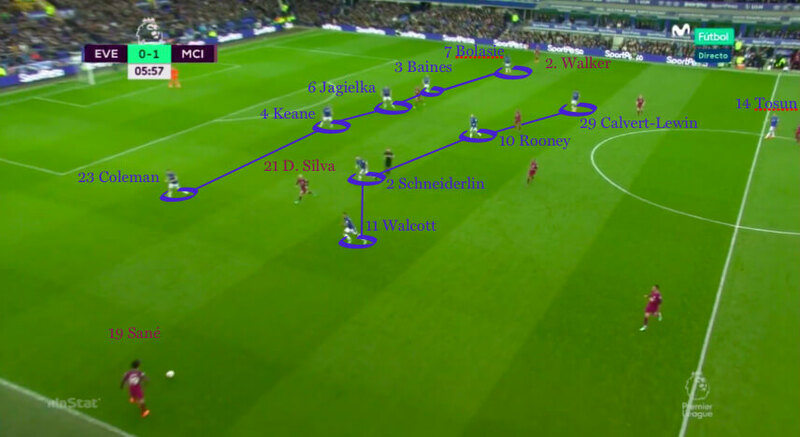 This enabled them to switch the play, should they need to penetrate over or around Everton’s compact defensive units. David Silva in particular frequently found pockets of space in between Michael Keane at centre-back and Seamus Coleman, permanently occupied by the width of Sane, at right-back. 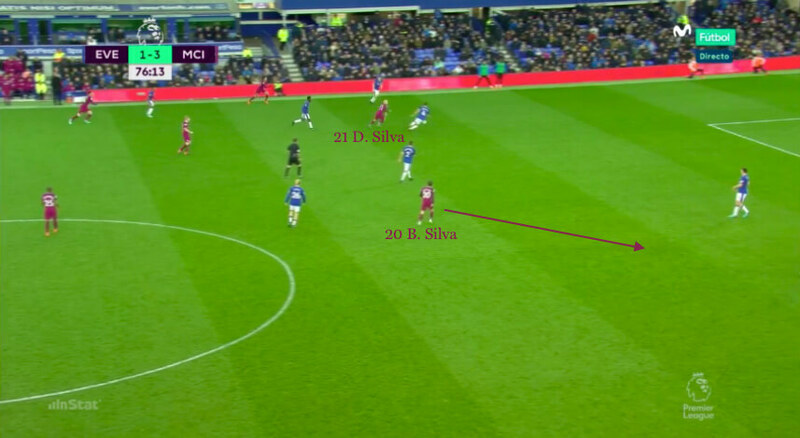 The movement and positioning of Sterling and Jesus worked to lure Everton’s defensive midfielders away from areas that Silva was also able to exploit. When Man City didn’t have the ball, they counter-pressed to regain possession quickly and stopped Everton winning crucial second balls. They also converted into a back four, with Walker dropping into his usual right-back role and Laporte moving across to left-back. With the game realistically won by half-time, City continued to dominate possession throughout the second half. They continued to circulate the ball at a high tempo, often pulling Everton’s midfield apart, with frequent and precise vertical passing. As Everton became more and more compact, clear-cut chances became harder to come by and they were often restricted to long-range efforts, particularly from the late central runs of Fernandinho. City still tried to create chances, though, and looked to Silva, Sterling and Sane to rotate in an attempt to unsettle the compact Everton rearguard. Manchester City dominated throughout the entire game. They consistently built from deep with ease, creating a central overload to bypass Everton’s initial lines of pressure. After a rampaging start with two well-worked goals, the visitors were firmly in charge from the opening minutes. Everton struggled to make the most of their long and direct forwards balls from deep. Despite winning most of the first balls, they struggled to have any impact against a relentless City press that won a vast majority of second balls and forced them back into their solid defensive structure. The pace and threat of the City counter-attack was such that Everton never opened up enough to create any serious threat of their own. With the exception of a brief 10-minute spell during the second half, Man City were comfortable in possession, maintaining the rhythm and tempo of the game. 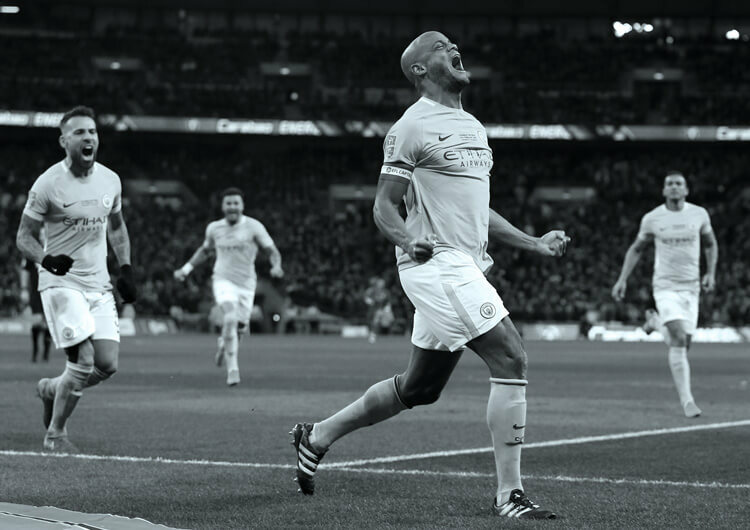 David Silva found space time and again in the inside left channel, thanks to the supporting runs and movement of Leroy Sane, Raheem Sterling and Gabriel Jesus. The deeper-lying Kevin De Bruyne and Fernandinho orchestrated play with their incisive passing. 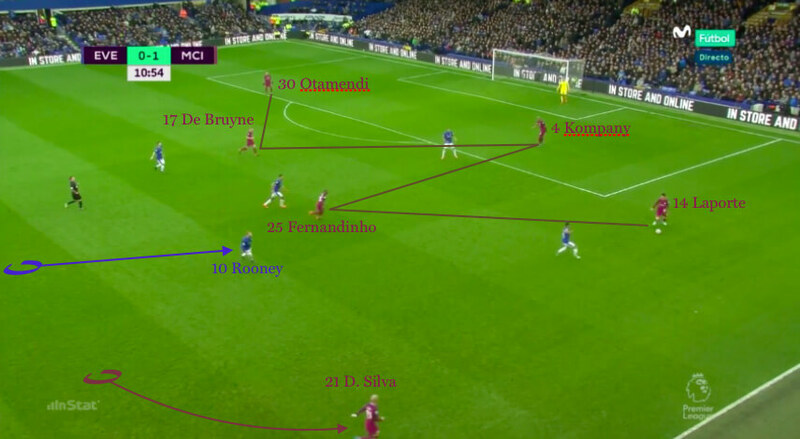 After Everton grabbed a well-taken consolation goal from Yannick Bolasie, they reverted into a compact 4-5-1 shape, limiting Man City’s time and space in advanced areas. The visitors were restricted to shots from long range, but they maintained their dominance in possession and strolled home to victory.